The water and dust protection for electrical equipment is determined by means of IP rating also known as Ingress Protection Rating – in the form of IPxx of electrical equipment. The standard for SFS-EN 60529 + A1 has been published in 2011 for electrical equipment protection and is suitable for almost every electrical appliance including light. In this blog post we will cover the basics of IP rating in relation to lighting. 1. What is the IP rating? 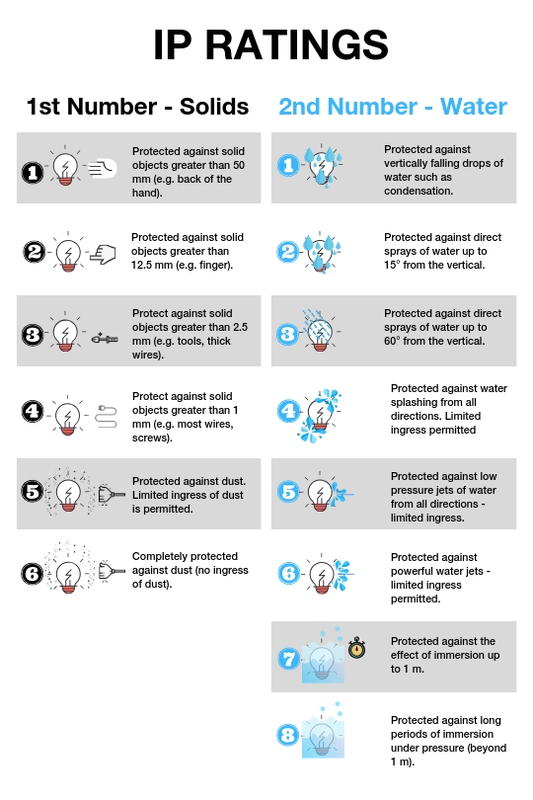 IP rating is followed by a series of two digits explaining how an electrical product’s exterior case or enclosure can protect the inside part from water dust or solid object intrusion, in help of keeping the product electrically safe. The first number tells you about the protection of this electrical device against dust and some other solid objects. The second number tells you the protection level against liquid such as water. In some cases, there is no data on the dust or water resistance of the device, or it has not been tested yet, then the number will be replaced by the letter X.
Let’s take some examples with IP21, IP44, IP 65 and IP68. IP24: The device is shielded so that dust can not reach inside of the electrical appliance. It is protected against any solid object over 12 mm. Meanwhile, vertically failing drops of water will have no chance to get inside the product such as condensation. IP65: The device has the highest rating against dust which can be seen as dustproof as well as waterptoof. Electrical installations for bath and shower rooms are subject to SFS 6000-7-701 standard. This standard defines three areas which limit the location of electrical equipment in the immediate vicinity of showers and tubs. The diagram from TUKES below describes the areas. As we can see from picture above, the bathroom is usually divided into 3 zones: ZONE 0, ZONE 1 and ZONE 2. Zone 0 is inside the bath or under the shower. Any light installed in this zone must contain low voltage which is 12W maximum and the rating should be at least IP67 which is total immersion proof. There is a need to follow these carefully when installing or designing lighting fixtures for better safety. 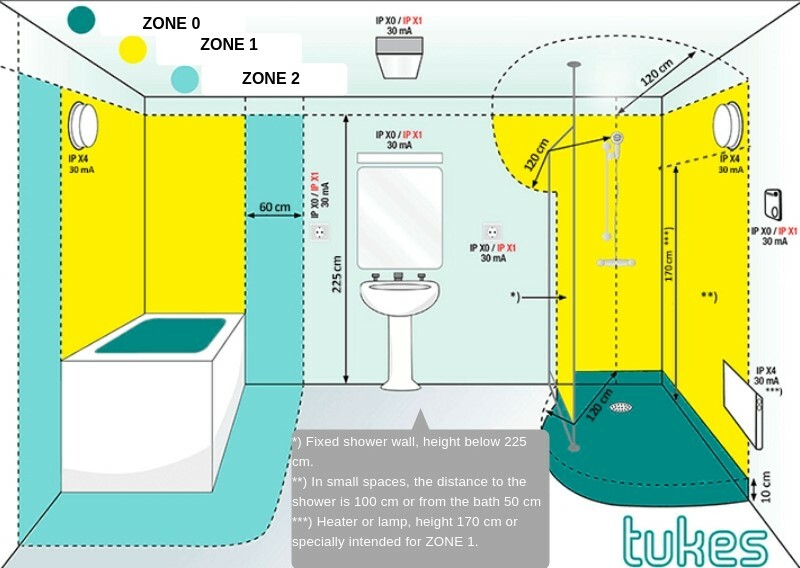 Zone 1 is the area above the bath or in shower area to a height of 225 cm from the floor. Theoretically, the light used in this zone must have a minimum rating of IP45, however, in general, it is accepted to install light with IP65 to ensure safety. It's also worth noting that most shower lights are rated at IP65 in any case. Zone 2 is an area stretching 60 cm outside the perimeter of the bath and to a height of 225 cm from the floor. In this zone IP rating of at least IP44 is required. In addition, it is good practice to consider the area around bathroom sinks and make sure that there is at least 60 cm between the sink and the lighting fixture. Any other zone that has not been described earlier, is called an Outside Zone. In these are, normally, there are no IP special requirements but if you intend to install a light fitting there, the rating needs to be IP20+. Some light for outdoor purpose usually used are security lighting, lighting for garden and path lighting. 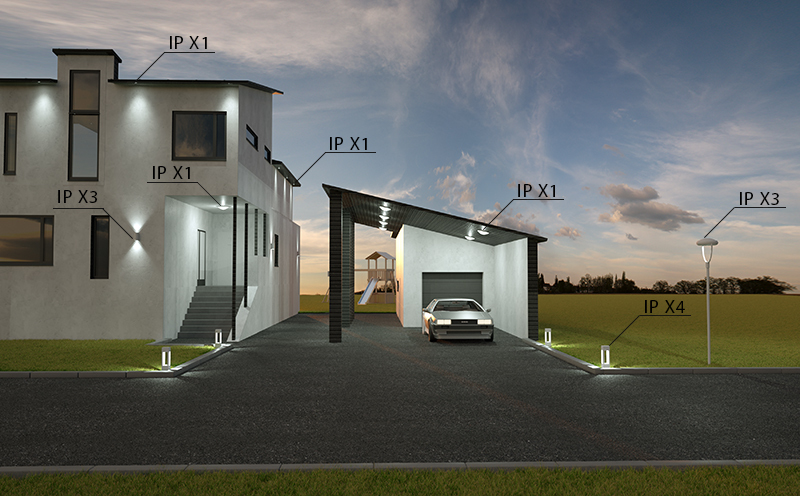 With security light, the IP rating is required from IP44 to IP68. However, when the lighting fixture is installed near or on the wet surface, IP67 or more is strictly requested. About garden area, we advise to get luminaries with IP rating between IP54 to IP 65. About Path lighting, these lights should be equipped with high IP (IP65) rating in order to protect the lighting fixture against dust and water. Inlet and car roof lights must be rated at least IPX1. For example, Kanna 12W is suitable for this. Lamps mounted under the eaves should also be at least IPX1. In practice, any of our downlights are suitable for this, but usually if the lights are embedded, they are very small and narrow, for example Libra 6W. The IP rating of the wall lamps must be at least IPX3. This is ideal for our Linder 8W. Column lamps should also be at least IPX3. For example, this is our Cajon 40W pole lamp.